Running out of ideas about what to buy yourself for Christmas? Despair no more shall wound thee. If I can lift myself out of my pre-Christmas wind down and put key to pixel, I'll be spending the next few days suggesting little stocking fillers to offer yourself as tokens of self-esteem. 'Drink a pot of ale, eat a scoop of Stilton every day, you will make old bones.' so the old saying goes. 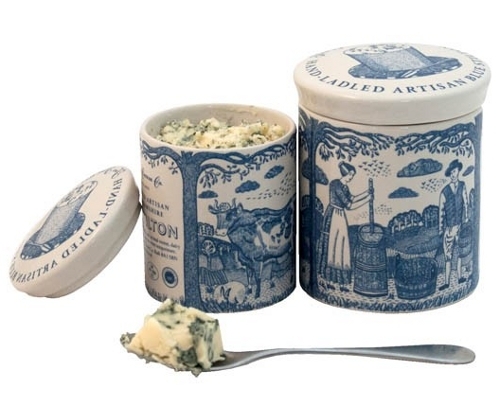 Then how about this lovely ceramic pot of Stilton above? It's available from The Fine Cheese Company (Bath) and Cheeses of Muswell Hill (London) and other quality cheese outlets. Made in Nottingham, England, the cheese is hand-ladled. 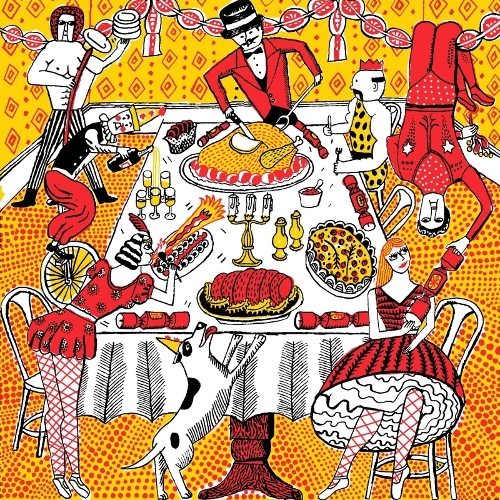 The ceramic pot is illustrated by John Broadley who also designed the charming Christmas card below. Tweedy's Hope: Is the pot made in the Potteries of Stoke-on-Trent? Hope so. Stilton needs a nice drop of port to accompany it; or to pour over it even. If you've never poured port over Stilton, it's an interesting tradition that may have started as a practical way of killing the mites on the cheese in less hygienic times. Give it a try this Christmas.